Fireworks light up the night sky over the Charles River as Boston celebrates Independence Day 2008. See pages 10–11 for more photographs from the Fourth of July. 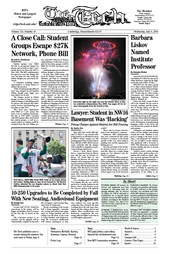 Student groups were billed $27,000 in unexpected charges for phones and network in June, covering the fiscal year from July 2007 to June 2008. The MIT administration has agreed to cover the charges this year, but plans for who would pay similar charges next year remain uncertain. Associate Provost for Faculty Equity Barbara H. Liskov became an Institute Professor, achieving the highest faculty rank at MIT, on July 1. More than four weeks after Michael P. Short G was arrested after being found in an off-limits location in NW16, felony charges are still pending against him. Despite silence from officials at MIT, Short’s lawyer seems optimistic that the charges will eventually be dropped as in previous hacking-related cases. Lecture hall 10-250, closed for renovations in the spring, will be bigger and brighter when it reopens for the first day of classes in the fall.